This is what I did for over our bed. The fabric is napkins from Pottery Barn (one napkin covers 2-3 letters), and it’s ModPodged (matte) onto those 99cent letters from Hobby Lobby. Then I hot glued a ribbon to the back and stuck it up on the wall with a thumb tack. I love the pop of color and whimsy in our otherwise solid-colored room. 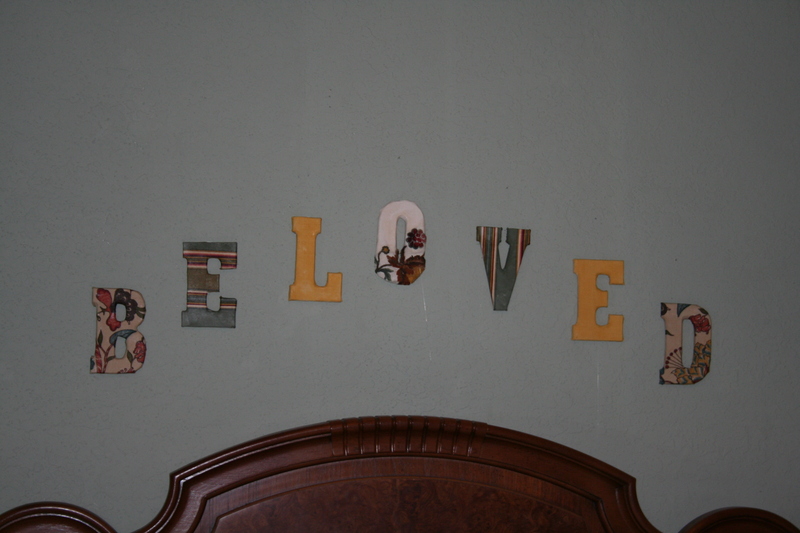 You could do something similar with a child’s name in their room, with any leftover fabric you have. With that, we’re officially done with big decorating/renovating projects, 3/4 of the decluttering/organizing is done, and school prep work for next year is mostly done. I’m ready to sit around and do nothing for a while! I love this! Our bedroom is paneled, really old antique paneling my husband doesn’t want to paint over. Hanging things on it that will show up and brighten the room is hard. This (or the embroidery hoops) could work easily in bright florals or retro florals. They also look lightweight, which is good, because I don’t like heavy or glass-framed things above my head in bed (LOL!) and we have rock hard plaster behind the paneling which means it’s hard to get a nail really well-set in the wall for heavy things. The thumbtacks would work, though, for something light like this. Thank you! I know, I never wanted anything that could fall on my head either! Made me nervous. If you do this or the hoops, you should post a picture on your blog!